In my previous post, I examined a recording of LilacSat-1 transmitting an image. I did some calculations regarding the time it would take to transmit that image and the time that it actually took to transmit, given that the image was interleaved with telemetry packets. I wondered if the downlink KISS stream capacity was being used completely. You can find more information about the downlink protocol of LilacSat-1 in this post. The important information to know here is that it consists of two interleaved channels: a channel that contains Codec2 frames for the FM/Codec2 repeater and a channel that contains a KISS stream. The KISS stream is sent at 3400bps. At any moment in time, the KISS stream can be either idling, by sending c0 bytes, or transmitting a CSP packet. The CSP packets can be camera packets (which are sent to CSP destination 6) or telemetry packets (and perhaps also other kinds of packets). I have extracted the KISS stream from the recording and examined its usage to determine if it is being used at its full capacity or if it spends time idling. The image below represents the usage of each byte in the KISS stream, as time progresses. Bytes belonging to image packets are shown in blue, bytes belonging to other packets are shown in red and idle bytes are shown in white. (Remember that you can click the images to view them in full size). The first 3 or 4 seconds of the graph are garbage, since the signal wasn’t strong enough. Then we see some telemetry packets and the image transmission starts. We observe that most image packets are transmitted leaving an idle gap between them. The size of the gap is similar to the size of the image packet. 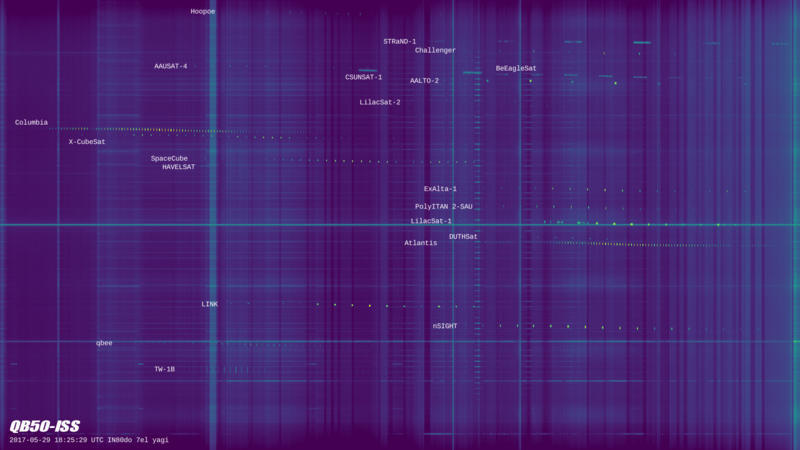 Every 10 seconds, a bunch of telemetry packets are transmitted, in a somewhat different order each time. Some telemetry packets are sent back to back, and others are interleaved with image packets. Image packets are only sent back to back just after a telemetry transmission. The next graph shows the usage of the KISS stream averaged over periods of 5 secons. The y-axis means fraction of capacity of the link, so a 1 means that the full 3400bps are used. The capacity spent for image packets is shown in blue and the capacity used for telemetry is shown in red. The green curve is the sum of the blue and red, so it means the fraction of time that the link is not idle. We see that the link is never used completely. The total usage ranges between 60% and 90%, but never reaches 100%. As expected, the capacity used for telemetry spikes up every 10 seconds. The blue curve is more interesting. It is roughly around 55%, but whenever telemetry is sent, it decreases a little. Just after each telemetry burst, the blue curve increases a little. This matches the behaviour we have seen in the previous graph. Every 10 seconds a telemetry burst is sent, using up some capacity that would normally be spent for image. After the telemetry burst, some image packets are sent back to back in a burst, peaking up to 60% capacity, but soon the packets continue being sent with idle gaps between them, and the capacity goes down to 55%. It is a bit strange that the link is not fully utilised. One would expect that image packets are sent as fast as possible, stopping only to send telemetry. However, we have seen that there are many idle gaps. It seems that the image can’t be read very fast or that there is some other throttling mechanism. This would explain why a burst of image packets is sent after each telemetry burst: the image packets buffer up, because the link is sending telemetry. When the link is no longer busy with telemetry, it sends all the buffered image packets in a row, but soon enough image packets can’t be produced as fast as the link sends them, so idle gaps appear. This seems quite an important performance issue, as it appears that image transmission speed is capped at about 1870bps. The Python code that generated these graphs can be seen below. The KISS file is also in the same gist. Yesterday, Wei BG2BHC posted on Twitter an IQ recording of LilacSat-1 sending an image. LilacSat-1 has an onboard camera and it can send images using the same format as BY70-1. However, one has to keep in mind that in LilacSat-1 the Codec2 frames and the KISS stream with telemetry and image packets are multiplexed as described here, whereas BY70-1 only transmitted the KISS stream with telemetry and image packets. As in the case of BY70-1, the camera is potentially open to telecommand by all Amateurs, although it seems that system is not enabled yet. The signal in Wei’s recording is very strong and stable, about 20dB SNR in its natural bandwidth of 13kHz. Therefore, it is no surprise that the image can be decoded without errors. When BY70-1 was in orbit, it was quite difficult for an Amateur station to get a perfect decode of the image, since a single fade in the signal would completely corrupt the JPEG file. LilacSat-1 doesn’t seem particularly stronger than BY70-1, so the same degree of difficulty can be expected. Of course, a well equipped groundstation such as the one in Harbin Institute of Technollogy will have no problems to get a good decode, as shown by this IQ recording. Amateurs with more modest stations should resort to a collaborative effort to try to combine the different packets that form the image, as received by several stations. Currently this procedure can only be partially automated by software, because the CRC algorithm used in LilacSat-1 is not publicly known, so it is not possible to check the packets for bit errors.  The image transmitted by LilacSat-1 can be seen above. Its size is 13861 bytes and it took 217 camera packets and 1 minute and 26 seconds to transmit. This is pretty good, as it means that several images can be taken and transmitted during a pass. Recall that the downlink of LilacSat-1 transmits at 4800bps, but 1400bps are taken for Codec2, leaving 3400bps for the KISS stream containing image packets (and telemetry packets). Each camera packet contains a 64 byte JPEG chunk, but taking into account headers it is 87 bytes long. We also need to take into account the overhead of the KISS stream. Assuming that no bytes have to be escaped, we just need to include 2 extra bytes for the frame delimiters, so a camera packet takes 89 bytes from the KISS stream and so it takes 197ms to transmit. This means that the image above could have been sent in only 43 seconds. All the extra time is probably due to the fact that the image was sent interleaved with many telemetry packets, although it would be interesting to examine if the KISS stream was in fact completely busy all the time during the image download. The complete telemetry log decoded from this recording is in this gist. I have also taken the GPS data from the telemetry and plotted it in the map below. The position of the Harbin Institute of Technology, where the recording was made, is also shown. 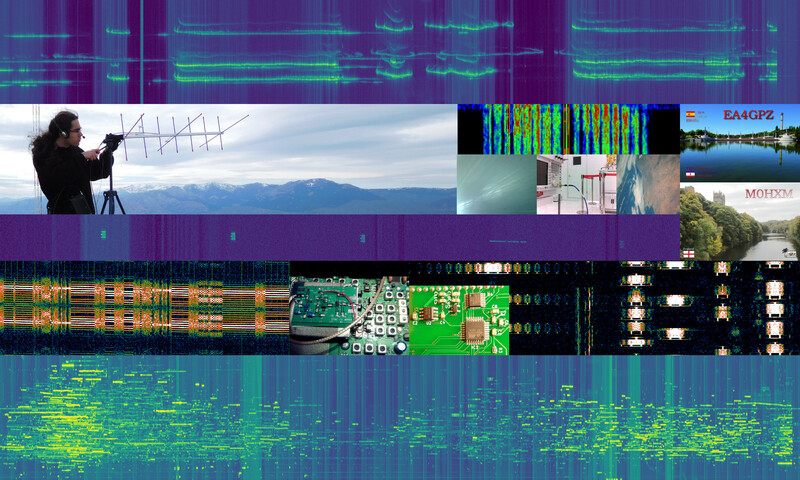 A 48kHz WAV file extracted from the recording has been included in satellite-recordings. It can be fed directly to the gr-satellites LilacSat-1 decoder. The NanoCom U482C is a a transceiver made by GOMspace intended for cubesats and other small satellites. Currently, it seems to be out of production, since it has been superseded by the newer NanoCom AX100, but nevertheless the U482C is being flown in new satellites, such as the QB50 AU03 INSPIRE-2. The U482C is also used in GOMspace’s cubesat GOMX-1, so we may say that GOMX-1 is the reference satellite for U482C. My gr-satellites project includes a partially reverse-engineered U482C decoder which is able to decode GOMX-1 and several other satellites. It does CCSDS descrambling and Reed-Solomon decoding. Recently, Jan PE0SAT made a recording of INSPIRE-2. I tried to decode it with gr-satellites and although the signal was very good, the Reed-Solomon decoder failed. The history behind this recording is interesting. After being released from the ISS near the end of May, INSPIRE-2 wasn’t transmitting as it should. The satellite team got in contact with Amateurs having powerful stations to try to telecommand the satellite and get it transmitting. Eventually, the CAMRAS 25m dish was used to telecommand and activate INSPIRE-2. Later, Jan made a recording from his groundstation. After exchanging some emails with the satellite team, I learnt that the U482C also supports an \(r=1/2\), \(k=7\) convolutional code, which is used by INSPIRE-2 but not by other satellite I’ve seen. I have added Viterbi decoding support for the U482C decoder in gr-satellites, so that INSPIRE-2 can now be decoded. Here I describe some details of the implementation. Today I’ve finally had some time to test the LilacSat-1 Codec2 downlink on the air. I’ve been transmitting and listening to myself on the downlink during the 17:16 UTC pass over Europe from locator IN80do. The equipment used is a Yaesu FT-2D for the FM uplink, a FUNcube Dongle Pro+ and my decoder from gr-satellites for the downlink, and a handheld Arrow satellite yagi (3 elements on VHF and 7 elements on UHF). Here I describe the results of my test. In the previous post, I analysed a QB50 recording. Now I have prepared some waterfalls from my recording using the procedure I already described a while ago. The image above is obtained from a 1600×1024 waterfall with a resolution of 2.93kHz or 0.86s per pixel. I have labelled all the satellites and cropped it to a 1600×900 image that now I’m using as my desktop wallpaper. I have also made a large 14120×16384 image with a resolution of 183.1Hz or 0.1s per pixel. The image can be downloaded here (142MB). I have found the following interesting crops within the large image. Remember that you can click on each image to view it in full size. The fast fading that I detected in nSIGHT is clearly visible below. Note that the beacon period is almost, but not quite, an integer multiple of the fading period. In the image below, we can see that SpaceCube is not very stable in frequency. The carrier frequency tends to rise rapidly each time that the transmitter goes on. Also, the overall trend is a frequency increase, counteracting the frequency decreasing effect of Doppler. This excerpt is near the end of SpaceCube’s pass, so the change in Doppler is not so large. The other French satellite, X-CubeSat, also shows a similar behaviour. AAUSAT-4 usually transmits in 4k8 FSK using CCSDS FEC, but it also transmits a CW beacon sometimes. Both can be seen below. Finally, a couple of CW satellites with interesting behaviour. On the upper part of the image below we can see BeEagleSat with fading. On the lower part, we can see Aalto-2 with its characteristic sidebands.